George Frideric Handel, Composer - Emmanuelle Haim, Conductor, MainArtist - Orchestre du Concert d'Astrée, Orchestra Copyright : 2014 Parlophone Records Limited, A Warner Music Group Company. 2014 Erato/Warner Classics, Warner Music UK Ltd.
Andrew Staples, Tenor Vocals, FeaturedArtist - George Frideric Handel, Composer - Emmanuelle Haim, Conductor, MainArtist - Orchestre du Concert d'Astrée, Orchestra, FeaturedArtist Copyright : 2014 Parlophone Records Limited, A Warner Music Group Company. 2014 Erato/Warner Classics, Warner Music UK Ltd.
George Frideric Handel, Composer - Emmanuelle Haim, Conductor, MainArtist - Orchestre du Concert d'Astrée, Orchestra, FeaturedArtist - Choeur du Concert d'Astrée, Choir, FeaturedArtist Copyright : 2014 Parlophone Records Limited, A Warner Music Group Company. 2014 Erato/Warner Classics, Warner Music UK Ltd.
George Frideric Handel, Composer - Emmanuelle Haim, Conductor, MainArtist - Christopher Purves, Bass Vocals, FeaturedArtist - Orchestre du Concert d'Astrée, Orchestra, FeaturedArtist Copyright : 2014 Parlophone Records Limited, A Warner Music Group Company. 2014 Erato/Warner Classics, Warner Music UK Ltd.
George Frideric Handel, Composer - Emmanuelle Haim, Conductor, MainArtist - Tim Mead, Vocals, FeaturedArtist - Orchestre du Concert d'Astrée, Orchestra, FeaturedArtist Copyright : 2014 Parlophone Records Limited, A Warner Music Group Company. 2014 Erato/Warner Classics, Warner Music UK Ltd.
George Frideric Handel, Composer - Emmanuelle Haim, Conductor, MainArtist - Tim Mead, Counter-Tenor Vocals, FeaturedArtist - Orchestre du Concert d'Astrée, Orchestra, FeaturedArtist Copyright : 2014 Parlophone Records Limited, A Warner Music Group Company. 2014 Erato/Warner Classics, Warner Music UK Ltd.
George Frideric Handel, Composer - Emmanuelle Haim, Conductor, MainArtist - Tim Mead, Vocals, FeaturedArtist - Orchestre du Concert d'Astrée, Orchestra, FeaturedArtist - Choeur du Concert d'Astrée, Choir, FeaturedArtist Copyright : 2014 Parlophone Records Limited, A Warner Music Group Company. 2014 Erato/Warner Classics, Warner Music UK Ltd.
George Frideric Handel, Composer - Emmanuelle Haim, Conductor, MainArtist - Orchestre du Concert d'Astrée, Orchestra, FeaturedArtist Copyright : 2014 Parlophone Records Limited, A Warner Music Group Company. 2014 Erato/Warner Classics, Warner Music UK Ltd.
George Frideric Handel, Composer - Emmanuelle Haim, Conductor, MainArtist - Lucy Crowe, Soprano Vocals, FeaturedArtist - Orchestre du Concert d'Astrée, Orchestra, FeaturedArtist Copyright : 2014 Parlophone Records Limited, A Warner Music Group Company. 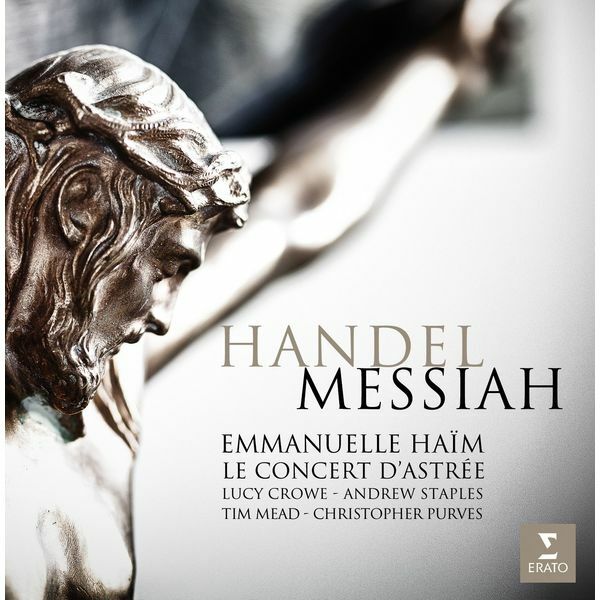 2014 Erato/Warner Classics, Warner Music UK Ltd.
George Frideric Handel, Composer - Emmanuelle Haim, Conductor, MainArtist - Tim Mead, Vocals, FeaturedArtist - Lucy Crowe, Soprano Vocals, FeaturedArtist - Orchestre du Concert d'Astrée, Orchestra, FeaturedArtist Copyright : 2014 Parlophone Records Limited, A Warner Music Group Company. 2014 Erato/Warner Classics, Warner Music UK Ltd.
George Frideric Handel, Composer - Le Concert d'Astrée, Orchestra, FeaturedArtist - Emmanuelle Haim, Conductor, MainArtist - Choeur du Concert d'Astrée, Choir, FeaturedArtist Copyright : 2014 Parlophone Records Limited, A Warner Music Group Company. 2014 Erato/Warner Classics, Warner Music UK Ltd.
George Frideric Handel, Composer - Emmanuelle Haim, Conductor, MainArtist - Lucy Crowe, Soprano Vocals - Orchestre du Concert d'Astrée, Orchestra Copyright : 2014 Parlophone Records Limited, A Warner Music Group Company. 2014 Erato/Warner Classics, Warner Music UK Ltd.
George Frideric Handel, Composer - Emmanuelle Haim, Conductor, MainArtist - Christopher Purves, Bass Vocals, FeaturedArtist - Tim Mead, Counter-Tenor Vocals, FeaturedArtist - Orchestre du Concert d'Astrée, Orchestra, FeaturedArtist Copyright : 2014 Parlophone Records Limited, A Warner Music Group Company. 2014 Erato/Warner Classics, Warner Music UK Ltd.
Andrew Staples, Tenor Vocals, FeaturedArtist - George Frideric Handel, Composer - Emmanuelle Haim, Conductor, MainArtist - Tim Mead, Counter-Tenor Vocals, FeaturedArtist - Orchestre du Concert d'Astrée, Orchestra, FeaturedArtist Copyright : 2014 Parlophone Records Limited, A Warner Music Group Company. 2014 Erato/Warner Classics, Warner Music UK Ltd.
2014 Parlophone Records Limited, A Warner Music Group Company.